It is known that the most effective help in the treatment of serious bites or stings of poisonous animals is the introduction of antiserum. Antisera are obtained by immunizing large animals with non-lethal doses of poison. However, when injected into a person’s bloodstream, antisera, like any foreign proteins, can cause serious complications right up to anaphylactic shock. Suggest an option for preparing an antiserum that does not cause such complications. The Great Pacific Garbage Patch is a vortex of anthropogenic waste in the central and northern parts of the Pacific Ocean. The main component of pollutant (about 80%) is plastic of different size and degree of degradation. Propose a scheme for purifying the world’s oceans from such debris, as a result of which the ecosystem can self-renew. 3. Medieval garden: determine the species and genus. 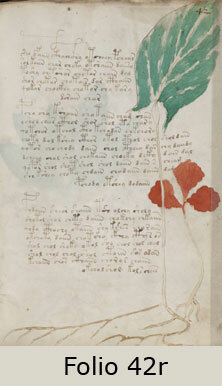 The “Voynich Manuscript” was written in the 15th century in an unknown language and is divided into 6 sections, one of which is commonly called “Botanical”. This section presents drawings of more than 100 plants, most of which are presumably classified. Two plants, presented in the figures, are not unambiguously identified. Propose and prove the classification for the plants shown in the figures (for Figure 42, there is a lower red plant). Offer your testing schemes for original drugs. Compare the testing schemes for the original drugs. * The Organizing Committee thanks Ekaterina Solodnikova, Medical Reviewer/Associate project manager, ZM Company for consultations.